Seattle's move of Jordan Simmons into the starting right guard role could have some interesting ramifications going forward. Time to address a couple of burning questions left over from the wake of the Seahawks’ 43-16 win over the 49ers on Sunday. Q: Did Russell Wilson really throw a shoe of a 49ers player downfield, resulting in a penalty on San Francisco? A: In case you missed it, 49ers coach Kyle Shanahan said Monday that the personal-foul penalty he received in the third quarter Sunday happened because he was arguing with officials because one of his players — linebacker Fred Warner — was called offsides. And the reason Shanahan said Warner was offsides? Because he was retrieving a shoe he said had fallen off and had been picked up and thrown by Seahawks quarterback Russell Wilson. The incident happened with the Seahawks ahead 27-10 and driving for a touchdown that put them ahead 34-10. The offsides and the unsportsmanlike conduct penalty moved Seattle from the 49ers’ 26 to the 11-yard line. Shanahan’s comments circulated on social media Monday night, compelling many to scurry and review the game film to see if they could find the offending shoe toss. Sadly, the incident was not captured on the TV copy. So maybe the All-22 copy, that comes out Tuesday would clear it all up? Nope. The shoe toss can’t be seen there either (which doesn’t mean Wilson doesn’t do it, just that the evidence is inconclusive). Wilson was not asked about it after the game since no one knew of Shanahan’s comments at the time, and he isn’t scheduled to talk to the media again until Friday (the Seahawks have a different schedule this week due to a Monday night game). But when he does, figure someone to try to, well, shoehorn a question in about all of this. Q: What happens with the right guard spot as D.J. Fluker is likely out for a few weeks? Carroll is famously optimistic about injuries, so saying Fluker may be out a couple weeks could indicate that he’s going to be out longer. If the Seahawks are able to keep winning and get the wild-card spot secured over the next 2-3 weeks, then maybe Fluker doesn’t play again until the postseason. In his place will go second-year player Jordan Simmons, whom the Seahawks claimed off waivers from the Raiders before the season. Simmons played at USC, and the Seahawks were said to always be intrigued by him (he had an injury-filled career at USC and started only two games as a senior in 2016 and was denied a sixth year of eligibility for 2017; he entered the NFL as an undrafted free agent). Simmons started against the Rams when Fluker sat with a calf injury. That was one of the Seahawks’ better offensive performances as they rushed for a season-high 273 yards in a down-to-the-wire 36-31 defeat to the team with the best record in the NFL. Simmons played the final 10 snaps Sunday against the 49ers once Fluker went out (Joey Hunt played the first snap). How Simmons does could greatly impact the futures of two players — Fluker, and 2017 second-round pick Ethan Pocic. He signed a one-year deal worth up to $1.5 million in March, lured in large part by his association with new Seahawks offensive-line coach Mike Solari, who coached Fluker in 2017 with the Giants. Fluker has dealt with a balky knee all year (he was limited through much of the offseason) and missed the first two games of the season because of a hamstring injury suffered in the preseason. Then came the calf injury, and now another hamstring issue (it’s unclear if this one is related to the one suffered in August). When Fluker got into the lineup and the Seattle running game took off, conjecture rose that Fluker would be in line for a big extension (speculation fueled by comments Carroll made during the team’s trip to London to play the Raiders when he said he would like to keep the offensive line together). But injuries are an unfortunate fact of football. Fluker has played only one full season since 2014. He missed four games in 2015, seven in 2017 and has played in nine of 12 so far this season with the chance he could miss four more. If Simmons plays well and the offense barely misses a beat, that could influence the decision the Seahawks will make with Fluker in the offseason. Starting left guard J.R. Sweezy is also on a one-year deal worth up to $1.5 million, and the Seahawks are already paying big money to center Justin Britt and left tackle Duane Brown. They will also have to consider if they want to extend right tackle Germain Ifedi this offseason (he’s eligible for either an extension or for the team to pick up an option for the 2020 season, once he concludes the third year of his four-year rookie deal). That could mean Seattle will want to play it conservatively elsewhere along the line, especially if Simmons can do the job. Simmons has just a one-year deal worth $480,000 this year but will be an Exclusive Rights Free Agent at the end of the season, meaning all Seattle has to do to bring him back is make him a qualifying offer. Pocic started the first two games of the season at left guard with Fluker out (Fluker went to RG once he came back and Sweezy switched from RG to LG). Pocic suffered an ankle injury and was inactive for the next three games. But he’s been healthy since the trip to London and available as an option. He has played only on special teams since and has been a healthy inactive twice in the last three games. Asked about Pocic Monday, Carroll said only that he remains an option, without elaborating. 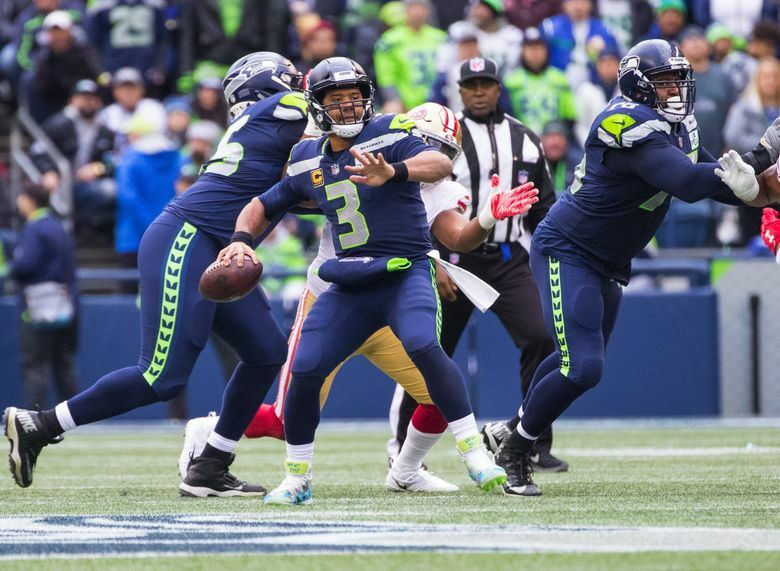 One thought is that he may simply not be as good of a fit for Solari’s system (though the Seahawks still are a heavy zone-blocking team despite the offseason talk of going with more man blocking). Pocic is in the second-year of a four-year rookie deal that pays him $665,411 this year and $865,822 and $1.06 million in 2019 and 2020, respectively. So there’s no decision the team has to make there other than to let Pocic continue trying to compete (and he also has value as a player who has experience at guard, tackle and center). But consider the right guard spot, and the fates of the players that play it, another compelling subplot of the last month of the season.